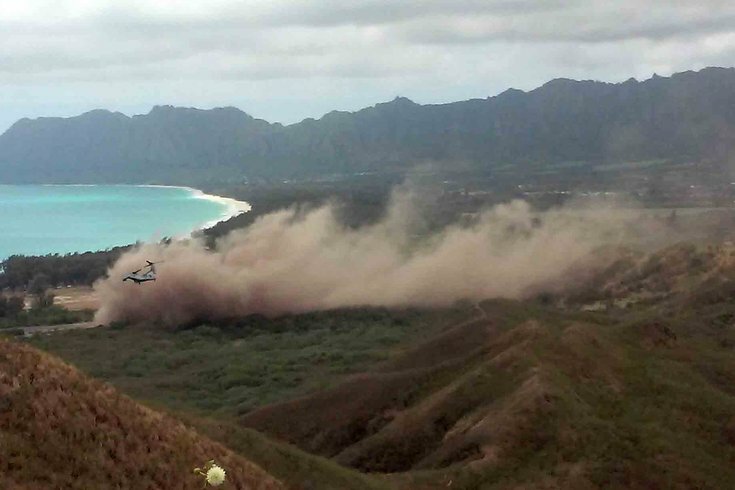 Debris rises as a Marine Corps Osprey aircraft, not pictured, makes a hard landing on Bellows Air Force Station near Waimanalo, Hawaii, Sunday, May 17, 2015. Several Marines from the aircraft were taken to a hospital, military officials say. A spokesman for the Marines said the accident happened about 11:40 a.m. local time on Sunday, leaving one dead. The other 21 Marines on board were taken to a hospital, and at least 12 were admitted for their injuries, according to ABC News and local news outlet Hawaii News Now. The Marines were members of the 15th Marine Expeditionary Unit, participating in training in an MV-22 Osprey at the time of the accident, the local news outlet reported. Honolulu firefighters and emergency crews responded to Bellows Air Force Station in Windward Oahu, Hawaii, where plumes of black smoke rose from the site. Officials with the Marines did not immediately respond to requests for comment.